One of the few plants known to have the capacity to change the color of its blooms is the hydrangea. For the bluest blue possible, there are a couple of points to consider beyond the use of chemical soil additives. White hydrangeas won’t ever turn blue--or pink either, for that matter. Your plant’s variety and the area weather conditions cause fluctuations in the intensity level of bloom color. When soil acidity levels change, hydrangea blooms change right along with them. The easiest way to govern the color of your hydrangea’s flowers is to grow it in a container, where you have total control over the soil conditions. If containerizing doesn’t work for you, then the addition of aluminum to your garden soil will. The plants you treat should be at least 3 years old. Test the pH level of the planting area. Ideal level for blue hydrangeas is 4.5, but readings falling between 5.2 and 5.5 are within an acceptable range. Water the planting area thoroughly to prevent chemical burns to the roots of your hydrangeas. Add aluminum sulfate to gallon of warm water and stir well. Follow the packaging instructions carefully. While applications may vary from one manufacturer to the next, typically 1 tbsp. of the chemical is appropriate. Apply to the hydrangea’s soil surface as directed. 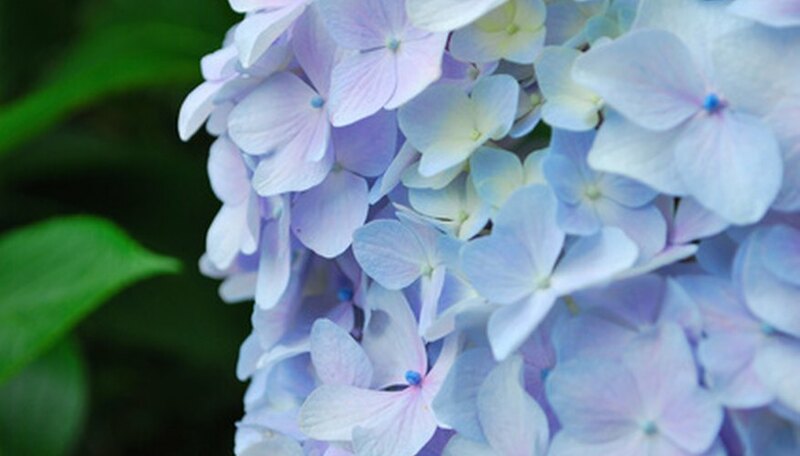 Feed your hydrangea a low-potassium 25/5/30 fertilizer for blooming plants to enhance the blue flower color. Follow the instructions carefully. Avoid super phosphates and bone meal soil additives. Mulch the plants with 2 or 3 inches of peat moss. This will go a long way toward helping nature along with reducing the soil pH and keeping your hydrangeas blue. Repeat aluminum sulfate applications throughout the growing season according to the manufacturer’s recommendations. Do It Yourself: Why Aren’t My Hydrangeas Blue? Hydrangeas Hydrangeas: How Can I Change the Color?